Fast-track power provides valuable energy to consumers around the world. Instant access to time-critical components and an experienced workforce is an important advance for corporations that are providing power to under-served areas and capitalizing on the global boom in electric consumption. At Equisales, we offer value, quality and 100 years of cumulative experience to clients in the fast-track power sector. Interest in fast-track solutions has increased exponentially in the past decade. Today, Equisales designs and builds substations that facilitate the transmission and distribution of electricity across the grid. The process starts at power plants where our generator step-up (GSU) transformers increase voltages for long-distance transmission. As three-phase utility lines travel closer to the point of use, our custom-designed distribution substations use step-down transformers to decrease voltages for local distribution and consumption at industrial facilities. 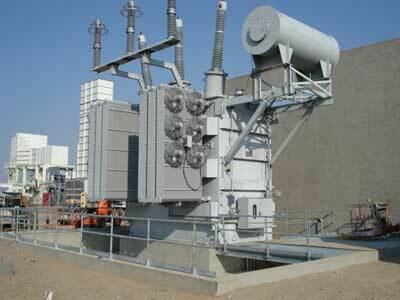 Networks of secondary substations provide power to local customers. At lower levels of the grid, additional transformers convert three-phase power to single-phase AC to support drop-lines for residential customers. At Equisales, we provide transformers, circuit breakers, switches and other components that are used at all high-voltage transmission and distribution sites. The market for fast-track construction is growing rapidly as utility providers in emerging and established markets consider the possibilities and cost savings that rapid solutions offer. It is our mission to provide services, experienced workers and equipment that is essential for planning and completing fast-track projects. Using designs supplied by the client or engineered in-house, our installation experts can complete critical builds with tight deadlines. The services and equipment that we supply fulfills the need for fast-track options that have the reliability of large-scale conventional builds and the benefits of short-term rentals. We give clients the flexibility to rent a single high-voltage transformer or an entire substation. Rentals can be retained for the duration of a project or until permanent equipment is acquired. When one transformer or step-up unit can delay critical operations, we provide emergency replacements with compatible ratings and specifications that can be rented while repairs are completed. We perform the following services for high-voltage clients in global markets. Assembly of transformers, circuit breakers and components is completed in the field and/or at our facilities depending on the type of equipment and shipment configuration. We can install purchased or rented equipment for fast-track projects. Our experts are available to construct high-voltage substations, switchyards and dead-end structures. Substation and transformer field testing ensures the safe operation of all electrical and mechanical components that we provide. Technicians are available to complete repairs on- or off-site. When major upgrades are required, we can provide rental equipment. To request a quote for substation equipment or construction services, give us a call at 713-733-3999. Our experts are available 24 hours a day to handle critical requests.